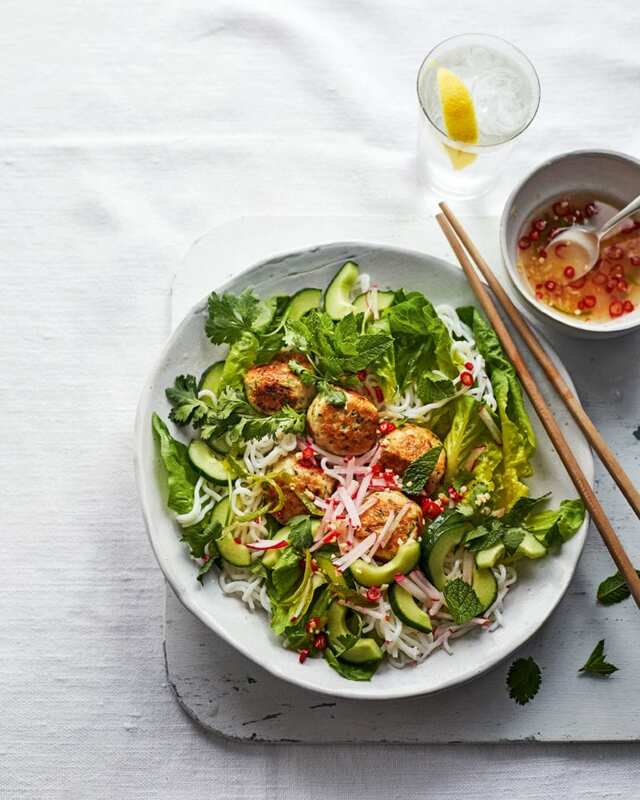 Try our recipe for homemade turkey meatballs served with noodles, greens and a zingy citrus-ginger dressing. It’s perfect for those looking to save on calories but not willing to compromise on flavour. Put the turkey mince, egg white, spring onions, chinese five-spice, coriander stalks, fish sauce and black pepper in a bowl, then use your hands to mix together. Season with a pinch of salt, then shape into 20 equal-size balls. Heat a large non-stick frying pan and spray its cooking surface with Frylight. Cook the meatballs, turning, until browned and cooked through (10-12 minutes). Do this in 2 batches to avoid crowding the pan. Divide the little gem leaves among 4 plates and top with the cucumber. Drain the noodles, then arrange on top with the meatballs and scatter with the reserved coriander, mint and chopped radishes. Mix the lime zest and juice, sesame oil, ginger, chilli and some salt in a small bowl, then drizzle over the salad. Serve straightaway. Open-freeze the uncooked meatballs on a tray, then transfer to a freezer bag and keep in the freezer for up to 1 month. These noodles are made from konjac, an Asian plant with a starchy, edible root/corm. It’s high in fibre and is almost calorie free. The noodles are ready cooked and come packed in water.